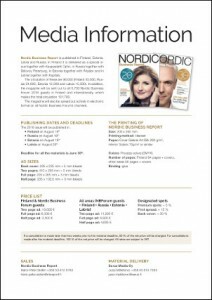 Nordic Business Report is an annually published high-quality business magazine. The magazine covers themes related to entrepreneurship, innovation, marketing and leadership. In addition, the magazine publishes rankings of successful business minds. In the 2012 issue, the ranking called Finland’s Thinkers 20 included Finland’s greatest business thinkers and in 2013 the ranking summed up the twenty greatest Nordic business minds in Nordic Thinkers 20 ranking. In 2014, Nordic Business Report published a 30 under 30 ranking covering Northern Europe, including Nordics, Baltics and Russia. The 2015 issue ranked the Top 20 Women in Business in Northern Europe including Nordics, Baltics and Russia. The 2012 and 2013 issues were published in Finland. For the 2014 issue the circulation expanded to Russia and Estonia and in 2015 the circulation included Finland, Estonia, Russia and Latvia. The magazine is produced by Nordic Business Forum and it is available only in English. The 2016 issue will be delivered as a special issue together with Kauppalehti Optio in Finland, Business Petersburg in Russia, Äripäev in Estonia and Kapitals in Latvia. makes the total circulation 101,700. The magazine will also be spread out actively in electronic format on all Nordic Business Forum’s channels. If you wish to advertise in the magazine, please contact us at info@nbreport.com.